My guess is that investors are slowly but steadily learning that actively managed mutual funds simply don’t live up to their promise. That is, the overwhelming majority of them do not outperform their respective indexes. What amazes me, frankly, is how much money is still invested outside of index funds. Granted, many investors are probably just unaware of their superior track record (and the reason behind it). But at the same time, if you ever read personal finance blogs, magazine articles, or discussion boards, then you’ve seen that countless investors do know about index funds and about how poor an investor’s chance is of beating the market on his own, but then they opt to try and beat the market anyway. It’s Not Just My Money. To me, depending upon your circumstances, ignoring all the evidence in favor of index funds seems irresponsible. To use myself as an example: I can’t imagine having to explain to my wife someday that she won’t be able to do all the things she has planned simply because I put my ego first by picking stocks, trying to pick hot funds, or some other similar strategy. Now perhaps if I was single, had no intentions of marrying, and had nobody financially dependent upon me in any way, then I might dabble in the exciting stuff. I might try to look for undervalued companies. I might make guesses about where the market is going next month. I might try to prove that I’m smart enough to beat the market. But as it stands now, with somebody else’s future on the line as well, I simply can’t justify it–especially not when I know that if I just decide to accept the market’s return and save/invest diligently, that we will be able accumulate enough money to fund our goals. Do you attempt to outsmart the market in one way or another? Or have you, like me, decided to take your stock-picking, Wall-Street-Journal-reading, CNBC-watching, 200-day-moving-average-monitoring ego and shove it away somewhere where it’s unlikely to show its face for the next few decades? I might try to be a bit of a devil’s advocate here; I am one of the crazies that tries to outperform. Nice contrast between buy and hold and timing. 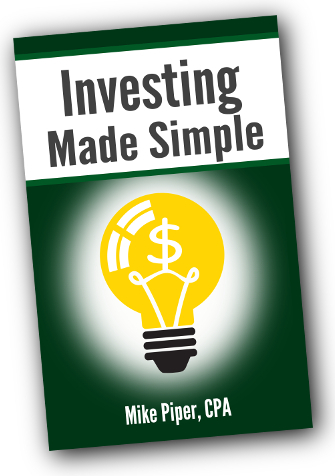 Returns are on page 26, tax considerations on page 31. I’d be interested in what you think. Depending on how you define the “market,” index investors are already outsmarting the market by being smart enough not to try to outsmart themselves. Money is invested outside of index funds because there is a truly massive marketing effort in place to sell active management. If you think about it, there are probably at least eight full page ads in magazines for companies that favor active management for every full page Vanguard ad that you see. There are at least eight times as many brokerage based advisors selling actively managed funds as there are fee-only advisors that recommend indexing. I’m not surprised there is eight times as much money in active management vs. index funds. It’s hard for the investing public to make themselves aware of the superior track record of index funds when the noise is eight times louder than the stuff actually worth listening to. It sounds like one of the more reasonable methods for attempting to beat the market in that it provides explicit rules to follow (which helps prevent fear/greed from getting in the way). And its results sure look good! At the same time, I’m a firm believer not in perfectly efficient markets, but in the efficiency-seeking tendency of markets–specifically, the more successful any strategy is at providing above-market risk-adjusted returns, and the more well-known such a strategy becomes, the less likely it is to be successful in the future. My believe in that efficiency-seeking tendency combined with my confidence that market returns will prove sufficient for my needs leads me to forgo such a strategy. In short, I certainly wouldn’t call you “a crazy” for utilizing such a method. But I’ll pass when it comes to my family’s money. I very much agree with the fact that when more people use a strategy, its effectiveness is dulled or erased. His paper has recently been the most downloaded one on SSRN, so we’ll have to see if his outperformance holds. And I’ll agree with your last point too…if you’re comfortable that a strategy is meeting your needs, there’s not much reason at all to change. I think it takes a certain amount of wisdom too- greed can prevent you from taking average returns… even though that is likely to be superior to chasing hot stocks or funds. The thing about strategies like the one Retirement Savior references is that, even if it is sound, it will have to cease to work at some point when the dollars following it achieve critical mass. Even if that takes several years it will eventually evolve into an underperforming strategy. Because of the relationship between performance and portfolio balance, an underperforming future year can easily wipe out all of the outperformance gains earned prior years. You could potentially avoid this if you did in fact have a winning strategy AND knew exactly when to abandon it. A recent piece from Financeware demonstrates how one could outperform by 1% each and every year for 10 years and all it takes is one year of underperformance by 3.2% in the 11th year to completely wipe out a decade of consistent, superior returns. I view it as irresponsible not to try to beat the market when the market is irrational (as it was from 1996 through 2008). To say that your goal is to perform as well as an irrational market is like saying that your goal is to drive as well as a drunk driver. I am happy that Passive Driving has not yet caught on quite as well as Passive Investing! As for Indexing, my view is that its association with Passive Investing has given Indexing a bad name. The great power of Indexing is that it makes long-term timing so easy to pull off. Future prices of individual stocks are not predictable, so timing doesn’t work well for non-indexers. With indexing, all that you need to know to engage in effective long-term timing is the starting-point P/E10 level and the long-term average return for U.S. stocks (6.5 real). Wall St. has proven conclusively that it is full of criminals intent on stealing money from investors. People will clearly invest in all kinds of casino-like schemes promising superior returns–Bernie Madoff & CDS’s anyone? One can try to time the market, and with enough research & dedication consistent and sustained success may be possible. However the data does NOT support this position. Many actively managed funds consistently under-perform the market. Consider that these are professional outfits with research staff, economists, and access to top quality information, etc. If the pros can’t beat the indices, how do you as an individual have a prayer of doing a better job? I’m not saying it can’t be done, it’s just highly unlikely. This is why investing savants like Buffet recommend a diversified, indexed portfolio for average investors. As we’ve discussed before, you know I dabble with active trading of both individual stocks and ETFs, around a core weighting towards index tracking funds. I’m sure such tinkering has done me better to date over the credit crunch and subsequent bear market than sticking in trackers throughout. I am thinking about keeping better records taking into account all payments in and out etc and benchmarking, but it’s a lot of work and of course it wouldn’t prove anything – I could just be lucky or unlucky. Alternatively, I may start a Monevator monthly portfolio pick or similar on the blog in 2010, and compare its performance with putting £1,000 into an index tracker. Regarding Dylan’s comment, I would suggest that his referenced paper is supporting the example strategy I posed. It lags the performance a bit during bull markets, but it shines during bear markets. So the marginal outperformance of B and H during bear markets is all lost during bear markets like 2000-2002 and last year, because of steep drawdowns. @Monevator, I would enjoy seeing your ideas in action. No matter the performance, it would at least help you clarify your ideas and strategies. If you want an easy process to keep track of your returns, TimerTrac.com could be very useful. Retirement Savior, after reading you comment, I had to double check to see if my link was to the wrong site (it’s not). I think you completely misread the author’s premise. The notion that active trading outperforms in bear markets it the result of inaccurate benchmarking. It doesn’t matter whether we’re in a bull market or a bear market, the math is the same, and the parts can never exceed the sum. Even if you found a strategy that outperforms in bear markets, it is not sustainable. Sooner or later, it would underperform in bear markets too. @Mike: According to Piscataqua Research, as of 2002, 50% of US pension funds are passively managed index funds. Does your stats only include mutual funds? In the grad scheme of things, I would think that the big money pools are in pension funds. FYI, I got this stat from pg 84 of Four Pillars of Investing. My understanding is that both of the headlines I quoted refer only to mutual funds available to individual investors. And from what I’ve read, you’re right: Pension funds and other institutional investors hold a huge part of the market. Just in the last couple days, I read an article (having trouble trying to find the link at the moment) about the recent shift of institutional investors toward passive investing as well. I’ll add the link if I can manage to find it. Thanks for the support guys — whatever the motivation ;).